I have been meaning to write about this neat little feature that was added to the govc CLI late last year that allows you to easily deploy any OVF/OVA without the need of ovftool. You might ask, why not use ovftool? Well, if you just need to perform a very basic OVF/OVA deploy and prefer not to install anything on your desktop, this can be a nice alternative. govc is provided as a simple binary that is platform agnostic and supports Windows, Linux & Mac OS X. govc is built using govmomi which is also known as the vSphere SDK for Go and this also means you can consume this capablitity beyond just the CLI but also programmatically if you wish. Obviously, the CLI is the easiest method which I will demonstrate below. Just to be clear, there is still a huge amount of value in using ovftool as it contains a large mount of functionality that is not found any where else. It is still the recommended tool for deploying OVF/OVA across all VMware based Hypervisors and is extensively used by other VMware's products for general OVF/OVA deployment. Note: If you are new to govc and want a quick primer on how it works, please head over to this article here for more details. Step 3 - Next, we need to setup a couple of GOVC environmental variables which will define the vSphere environment (ESXi or VC) you plan to deploy to. You also have the option to specify this in the command-line using the --help option for more details. In this example, I will just set them as environmental variables. Below is an example of my environment which is going to be deploying directly to an ESXi host, you will want to update these variables based on your environment. Note: There is a known bug currently in which the "Deployment" pararm is always generated. You will need to delete this if you have an OVA that does not use this parameter. I have already been reported here. Note: There is known bug in which you will see a warning about Invalid value for the network which you can ignore. I have already reported the issue here. Once the VM powers on, the OVF properties will automatically be injected into the VM and in a few minutes, you will have a fully configured VM. Pretty cool right!? What I really love about this solution beyond its simplicity is that the tool allows you to easily generate the OVF property spec file. This is much easier than having to manually inspect an OVF/OVA and then extract the params by hand which can be very error prone. Lastly, I want to give a big shoutout to Pieter Noordhuis who was the Engineer who had implemented this awesome feature and is also one of the Engineers who created govmomi. Thanks Peter! I would like to experiment with a VM distributed as an OVA with properties. But… is the above supposed to work on ESXi with a free license? Trying through the web interface (EHC), vSphere Client and ofvtool raises the same kind of error message. 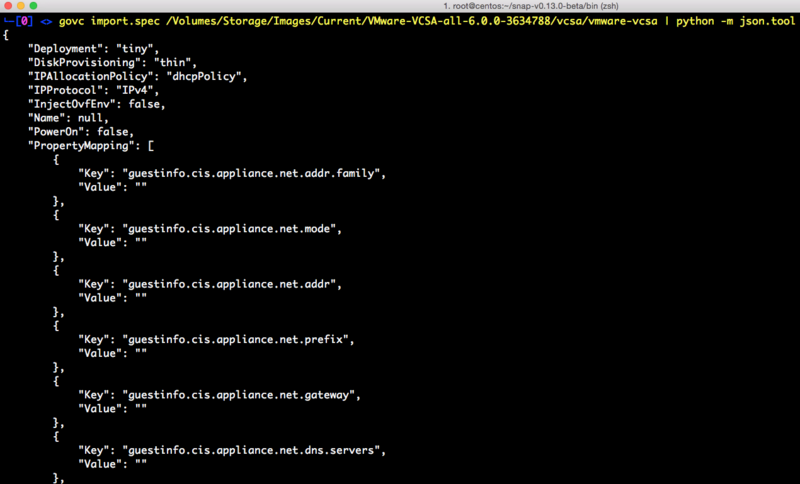 Seems vmware bundled their own CLI installer into the ISO. I have an ova that is stored locally on a ESXi host. However it is not clear to me, what path I need to provide for govc import.spec. InjectOvfEnv is not working for me on ESXi 6.5 and govc 0.15.0. Does this only work on vCenter not directly to ESXi? 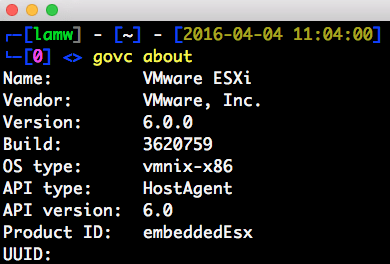 Works great on version 6.0 but I’m unable to make govc work with vsphere version 6.5. I always end with unconfigured VM (localhost instead of IP) . Any ideas? I was able to deploy it using govc but only “Stage 1”. Is there any way how to import “Stage 2” there as well? Thank you for sharing this! Being able to script this process, and do so without needing a vCenter Server, is a huge plus. Worked great for me.